Yesterday I mentioned that a Sasquatch—specifically, the tiny one on the cover of my book—had been spotted in the library at the University of Tennessee's College of Law. After that a few other people were kind enough to mention that they had seen one in their local libraries, too. I also learned (thanks, Michael Gordon) that through the magic of the intarwebz one can search the catalogs of many libraries at once. I guess I should have known that was possible. Anyway, that search reveals that more than a few librarians appear to engage in moderate to heavy substance abuse when deciding what books to stock. 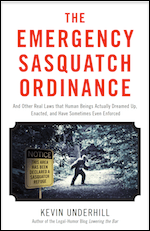 According to WorldCat, 55 libraries to date have acquired or are in the process of acquiring The Emergency Sasquatch Ordinance. That includes the Edward Bennett Williams Law Library at Georgetown, my alma mater, where I'm sure it's being displayed with great pride as an example of what Georgetown grads can achieve. (Probably right next to fellow alum Stephen Glass's masterwork, The Fabulist.) No, wait, it appears to be at call number K183.U53, on the fifth floor, in what appears to be a humor section. Did you guys know they had one of those? I sure don't remember it. At the other end of the country, it's also on the shelves at UC Hastings, which is actually where a chunk of it was written (mostly the stuff on ancient laws). There's probably a plaque at that one table on the fifth floor where I spent most of my time, or at least some now-crystallized jam from one of the donuts I snuck in there. The Hastings entry includes a quote that they are careful to mention is an "unedited summary from book cover" (emphasis added). No, please do not blame them for that. I haven't checked to see whether other authors get "credit" for their books rather than being assigned "responsibility," but I guess "responsibility" is probably more appropriate here. Thanks to all the librarians (and non-librarians) who have bought the book so far. I am proud to have it cluttering up your shelves. For those who are (understandably) waiting for it to hit Amazon.com, that is supposed to happen "soon."